When it comes to hiring and retaining millennials it is essential we understand how they operate within the workforce - check out part one of my two-part blog series. In my two-part blog series on The Secret to Hiring and Retaining Millennials, I will explain how their impact on the workforce, misconceptions, company culture and emotional intelligence all play a role in effectively integrating and working with millennials moving forward. During the research phase of my writing on millennials, I had the pleasure of working with Lukas Pesa, a researcher of generational differences and trends in the workforce. We connected to collaborate and develop three podcasts on millennials and discuss the millennial impact on the workforce. Let’s start with the definition, considering ‘millennial’ is a nebulous term for many. Millennials (also known as the Millennial Generation or Generation Y, abbreviated to Gen Y) are the demographic cohort between Generation X and Generation Z. There are no precise dates for when the generation starts and ends. Demographers and researchers typically use the early 1980s as starting birth years and use the mid-1990s to the early 2000s as final birth years for the Millennial Generation. There are lots of myths out there about millennials so it’s important to understand what they are because they have recently become the largest generation in the Canadian workforce. We need to get on board and adapt and learn to respect and work with millennials if we want to continue to succeed and flourish within the workforce. Graham makes excellent points that are hard to refute and I tend to agree with him overall. Lack of respect for hierarchy. In part one of this two-part series on The Secret to Hiring and Retaining Millennials we have covered off on understanding how unique millennials are, what common misconceptions and complaints about their performance within the workforce is and how and why they operate the way they do. Make sure you check out part two of this two-part blog series to learn more. INTERVIEW | Robert Murray Interviews Linda Marshall in a car! YouTuber Robert Murray interviews Linda Marshall in an episode “I’m in a Car.” Linda shares her expertise on emotional intelligence and her experiences in a family business. Darryl Hartwick, a journalism professor, interviewed Linda Marshall about some of her challenges in her personal journey including what changed her life. She speaks about Joy, Gratitude and the negative effects of the Drive-by Life Phenomenon. 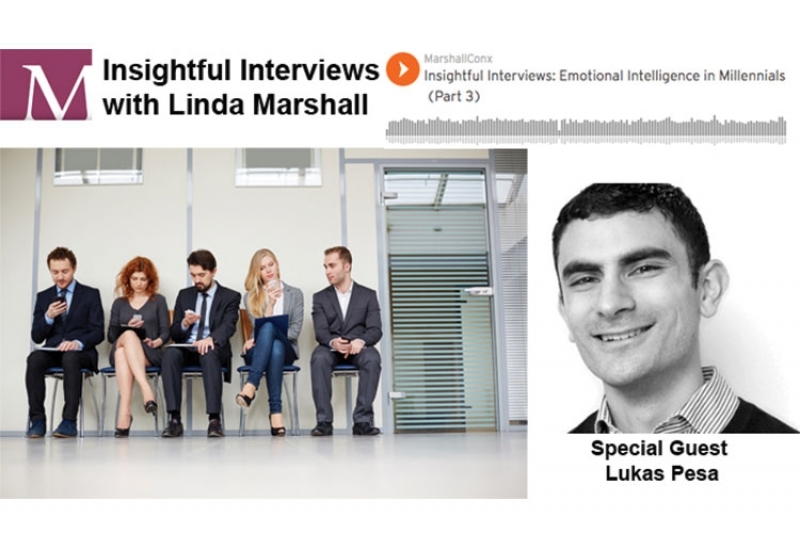 Enjoy our insightful interview with Lukas Pesa on Emotional Intelligence in Millennials Part 2. Thank you very much for your inspirational talk - I will enjoy reading your book and seeking ways to integrate your advice into my lifestyle.